Now Reading: Reverse Washing – To do? Or not to do? Reverse Washing – To do? Or not to do? Our verdict on hot-off-the-press hair care trends! Innovation and change are two constants in this world. Especially when it comes to makeup and beauty. But could you have thought that something as simple as washing your hair would get an upgrade? Well it has, and it comes in the form of Reverse Washing. It apparently adds an incredible shine and bounce to your hair, by a simple reversal of your hair washing routine. 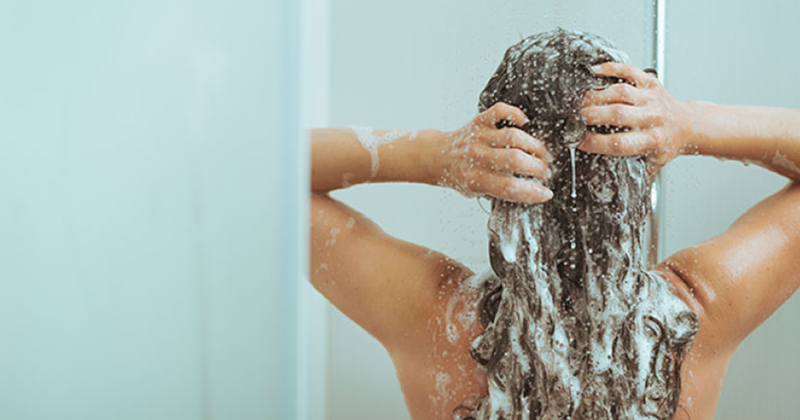 We’re going to break down this latest hair washing technique that’s taken the beauty world by storm, and see if it’s really everything it’s been made out to be. Simply put, reverse washing means conditioning your hair before washing it. It reverses the general washing process of shampoo followed by conditioner. If you are planning to try this, start with the conditioner, but do NOT rinse it off. Doing so, will lead to dry, brittle and tangled hair. Use your shampoo to remove your conditioner. Once that’s done, lather and rinse as usual. 1. Lesser breakage: Your hair tends to be weaker when it is wet. Reverse washing is claimed to reduce breakage, as the conditioner protects the wet (and therefore, vulnerable) hair. 2. It locks in moisture and natural oils, as your hair is protected from the harsh chemicals of shampoo. . For women with dry, frizzy, or treated hair, this is said to make your hair much more manageable. 3. No build up: Chances are, there is a residue of conditioner in your hair every time you step out of the shower. Shampooing post conditioning ensures that it is not left behind. So your hair is said to get added volume and bounce, which is a relief for people with greasy scalps and limp hair. Here’s a little back story. The PH balance of your hair and scalp is important. It’s what keeps your scalp free from dirt, grease, fungi, and bacteria. The right PH balance also maintains hair health by keeping your cuticle, the outermost protective layer of the hair shaft, closed and therefore smooth and shiny. Now when it comes to reverse washing, your PH balance is interfered with. The PH level of a shampoo is 8, which is high. This means that it causes your hair shaft to swell and the outer layers of the cuticle get raised. Conditioners have a lower PH level of 3, so it flattens the cuticles and restores the moisture balance after your hair has been shampooed. Ending with a shampoo means a raised cuticle, which makes the hair shaft weaker and more susceptible to any damage from styling or the external environment. There are other ways to condition and protect your hair from the harsh chemicals of shampoo. Oiling can do what reverse washing claims to do, without the harsh effects. The oil, specifically has the ability to penetrate deep into your hair shaft, under the cuticle, binding itself to your hair’s proteins and acting like an armour to the shampoo. A relaxing oil massage is all you need to protect your hair from breakage and damage during washing. And as a natural moisturizer, its effect is lasting, even after it is washed off. Another international hair care trend that has to do with the way we shampoo, called the Pre-poo trend, may prove far more effective. But that’s another story.